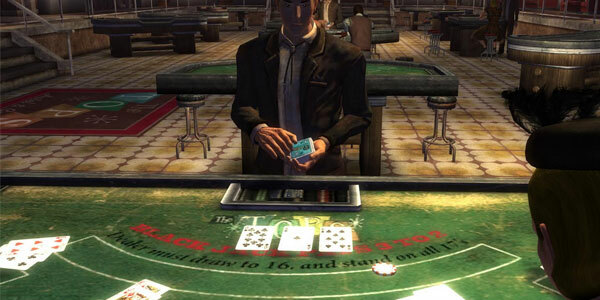 The Courier Who Broke the Bank achievement in Fallout NV can be obtained in the casinos of New Vegas by making so much money playing the casino games that they all eventually ban you from playing. WARNING! Once you receive this achievement you will be banned from the casino games and cannot play them ever again. However, the other services in the casinos are still fair game. If you enjoy playing in the casinos it would be better to leave this achievement for later. It is recommended to boost your characters "Luck" stats to a minimum of 7. This will help you win more often, but do not force it to 10 or try any hacks as this could cause the achievements to be blocked entirely. You can also get banned from The Atomic Wrangler, The Vikki & Vance and Sierra Madre casinos if you bet too much. But these do not count towards the achievement. First things first, you need to exchange your caps for casino chips. Find the bank tellers inside each of the casinos. Do not kill them or else it will be impossible to play the games and get the achievement. The Tops casino teller is a bit hidden, on the second floor, but the rest are easy to find. Step #1 - You can play any casino game like roulette or slots, but many players have found blackjack to be the fastest and most enjoyable way of nailing this achievement. The games are played just like in a real casino, so if you don't know how to play learn the basics of playing blackjack before you waste your chips, review these basic strategies for the game and use it as a cheat sheet. Step #2 - Make sure to have at least 500 caps when aiming for the achievement. Go to the game floor and find the blackjack table. If this is your first time in the casino, play a few rounds on the lowest bet. When ready, raise the bets to 100. If you get the message "You feel Lucky" while playing, it means the win was influenced by the players "Luck" stat, so make sure to have 7 or more points of this feature. Step #3 - After stacking some nice winnings, raise the bet to 200. Step #4 - As your chips stack up, every 25% into the achievement goal the casino staff will bring special rewards. LOOK OUT! There is a Bug in the Game - The rewards will not be given if the casino staff fails to reach your table in time. Make sure never to skip a reward being offered. It may also happen that the casino staff might get stuck on geometry and cannot reach you in time while you continue to bet. This bug was common on PS3 and Xbox consoles, so always wait until the staff reaches you before continuing with the table game. Step #5 - As you progress, what usually happens is you will have winning streaks, but then you might lose it all, it happens. When this happens, work your way up slowly again with the 100 to 200 bet increments until you break the bank of the casino. The Floor Manager will approach you to say you can no longer play in the casino, but you won't be kicked out. Step #6 - Exchange the chips for caps at the teller, take a few minutes before hitting another casino and repeat the process. It is best if you begin with the lower limit to higher limit casino; in the order of The Tops, Gomorrah and Ultra-Lux. If you followed our simple and easy steps, you should have received the "Who Broke the Bank" achievement and can use all your winnings to power up your guns and ammo. A great way to enhance your gaming experience! If you decide to get sneaky and save before playing in the casino to take a huge loss and then re- load to try again with all your initial chips; the dealer will take a 60 second break to change the deck as a deterrent to cheating. This break also applies to slots and roulette. Fallout New Vegas is a spin-off from the Fallout game series and was released in October of 2010. The game is set in a post-apocalyptic open world in a region that includes part of Nevada, California, and Arizona. A nuclear apocalypse devastated the world in 2077 in what is known as "The Great War", a conflict between the United States and China over natural resources. We are now in the year 2281, 4 years after the events of Fallout 3. The main character is the Courier. His job is to deliver packages across the Mohave Desert to the city of New Vegas. At the beginning of the game the courier is ambushed and left for dead. After surviving, the Courier begins a journey of revenge which will entangle him in a conflict for the Control of New Vegas. Fallout New Vegas was a commercial success with more than 5 million copies sold and winning the Golden Joystick Award for "RPG of the Year" in 2011. It is an amazing game that every avid gamer, and even casino player can enjoy!